DWC Potz are a hybrid design that combines deep water culture with a top feed drip system, showering the roots from above, whilst the deep water solution recirculates and bubbles down below. DWC Potz are supplied with two pumps, one is fitted in the main tank to fill the system and the other is fitted in the Header Potz with two inline taps fitted above. The taps allows you to recirculate the solution around the system or drain it back into the main tank. 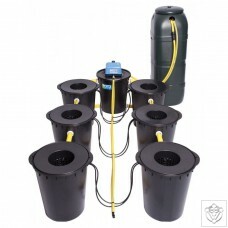 The 20 litre Potz are connected at the base with 25mm fittings and 25mm Torsino hose, and filters are also provided to prevent any roots entering the pipes and affecting the solution recirculating. These filters can easily be removed and cleaned whilst you are growing, and if any Potz where to fill, the 25mm overflow system fitted at the top of the Potz will simply transfer the excess solution into another Potz and prevent any solution spilling onto your floor. The air pump can be placed onto the Header Potz and left running 24/7 or if preferred it can be placed at the side of the Header Potz and the pipes can be angled to suit. DWC Potz do not need to be kept full, in fact you will get better results when you let the levels drop for a few days, before refilling the system. Click here for more details on The DWC Bubbler works.